Over at Beavis Audio they've posted a page of handy schematics. 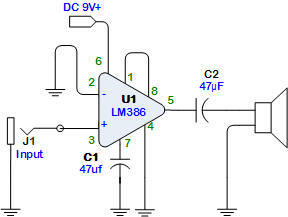 I love keeping schematic blocks like this within easy reach as I always seem to need a quick and simple oscillator, amplifier, or filter of some sort. "With all the bits of schematic goo I've been obsessively drawing over the years, it seemed like a good idea to put some of the fragments and misc blocks up on a page. Here it is: Blocks and Fragments. I'll update this page over time as I draw up new things. Note that most are fragments and some are unverified, but there should be some useful bits in there for you." Kinetic sculptor Aaron Geman is showing a wonderful new kinetic piece at Mercury20 Gallery in Oakland. I think the title is "Parallelotree and the Mechanical Wind", don't quote me yet though - we're looking into it. This is something I have been hoping to see (but smart enough to not try to do myself) ever since I first saw someone using TELEO modules way back when. But when I saw TELEO I knew I wanted something more, and different (and hopefully at a much lower price.) The TinkerKit is currently under development, and is not yet commercially available. We will certainly be following the project's progress with bated breath...or is that bated blogging? TinkerKit is an Arduino-compatible physical computing prototyping toolkit aimed at design professionals. The interest in physical computing as an area in development within the creative industries has been increasing rapidly. In response to this Tinker.it! is developing the TinkerKit to introduce fast iterative physical computing methodologies to newcomers, and particularly design professionals. What is the TinkerKit made of? The TinkerKit is currently composed of about 30 different parts: 20 different types of sensors, 10 actuators. 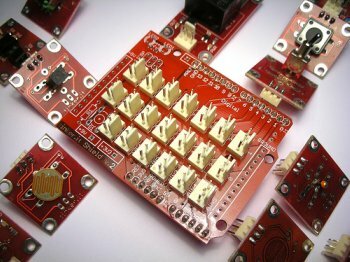 There is also a set of Arduino-compatible hubs. Each part of the TinkerKit has a standard connector that can be connected through a standard cable to a main hub. - A sensor hub for the Arduino (this is a shield that sits on top of the Arduino and allows the sensors to be connected easily). - A keyboard emulator (which converts any input from the sensors into keystrokes). Multitouch Prototype 2 from Randy Jones on Vimeo. So this got the attention of our (that being CTP and I) class today. Multitouch, pressure and velocity sensing?! And under $50 to make!!!? W00t! Three or four of us are gearing up to try and make one these, what, Intimate Controller? Multidimentional Force Sensor? I'm not sure what they are being called, but we want to make one this semester. CDM, I think, says it best: "Who needs a "top 10 technologies of 2008" post for CDM when this particular instrument could pretty easily top the whole list? Let’s just call it done, and uncork the champagne: major congrats, Randy!" But here is the kicker: the audio interface that he uses runs at about $1000. That's a bit steep for most people who are attracted to this project precisely because it is inexpensive. In the comments for the video, Randall hints at both OSC and use of the Arduino in future versions, so it doesn't sound like it's out of the realm of possibilities. If true, the latter would really allow this project to get it's legs, while the former could open up whole new realms of possibilities (video manipulation, use in Supercollider, Chuck or Processing). I don't know how old this is, but I just ran across it searching for something completely different (ok, not *completely* different, just not this, per se). 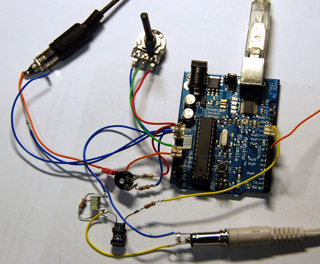 Anyways, it's a write up for doing realtime manipulation of an audio signal with an Arduino. Pretty cool, and considering all of the other things that you can throw into the mix with an Arduino (flex sensors, pressure sensors, distance sensors, the list goes on) this would be great for live performances.